COOLSTRUCTURES, INC, EPS Insulated Wall Panels are give engineers, contractors, and building owners unmatched flexibility to achieve LEEDs credits and green building standards for not only walls but also roofs and floors. AmeriCool Structural composite EPS wall paneling is incredibly strong, lightweight and easy to install. And nothing comes close to matching the energy-saving properties of our Insulated Wall Paneling. Over the past 20 years, COOLSTRUCTURES, INC. has developed an advanced insulated wall panel system with high “R” values which do not deteriorate over time. These architectural Insulated Panels offer unsurpassed thermal efficiency, are easy to install, and offer the lowest cost per “R”of any similar panel product. With AmeriCool structural wall panel products you save $ today and tomorrow. COOLSTRUCTURES, INC. EPS wall panels are manufactured in a variety of thicknesses between 2 inches and 12 inches. AmeriCool Structural continuous laminating line can manufacture panels in any desired length and to each jobs specific tolerance needs. Increased spans can reduce the extent of the internal steel infrastructure necessary to support the spans. COOLSTRUCTURES, INC. 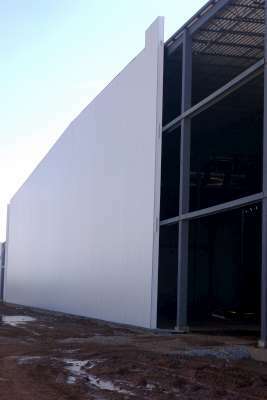 Insulated Panel Wall Systems are custom-engineered to meet the most demanding project requirements. The variety of exterior skins and internal core combinations can be blended to accommodate nearly any facility need. Continual innovations, computer-assisted design and manufacturing, and strict quality control guarantee flawless construction and superior insulating quality. Applications include industrial, commercial, retail, and residential buildings. These include cold storage, warehouses, food processing and storage, floral storage and transportation, pharmaceutical, and similar structures. Whether insulated wall panels, floor panels, or roof panels are required, Coolstructures can provide the ideal customized solution. insulated panels are a snap to install, using a simple "tongue-and-groove" design than reduces thermal bridging (heat loss), so prevalent in more complex designs. 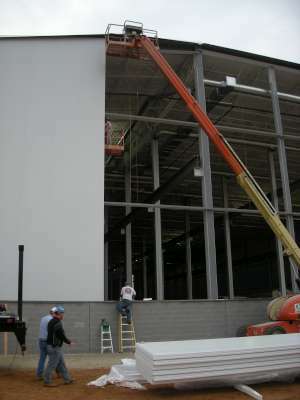 Wall panels simply slide into place and are easily secured to the building’s steel superstructure. In fact, Americooler Structural Insulated Wall Panels are so strong and secure; they actually enhance the strength and rigidity of the structure. Simply choose your “Exterior Skin” type and “Interior Core” materials to fit your specific job, and COOLSTRUCTURES, INC.Structural will help you custom tailor your building envelop package.